Has the spark has gone out? 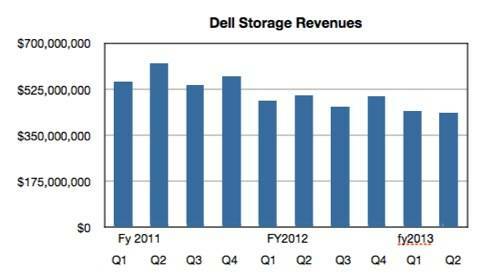 Despite acquisitions Dell's storage revenues have been declining for over a year. The effort to develop synergies between the products hasn't delivered the sales goods yet. Is it time for a re-think? 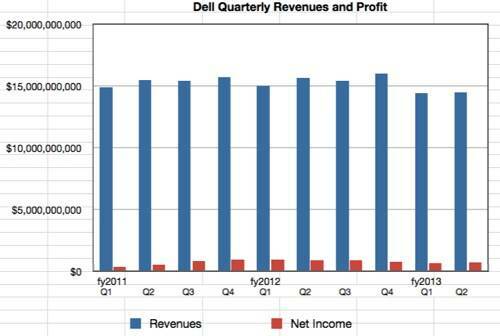 Fifteen billion dollars a quarter is impressive, but by Dell's standards the company is not doing as well as it should. It is reminiscent of a mature company unable to find a growth engine. One major growth engine – PC and notebook sales – has stalled as tablets wreak havoc and buyers wait for Windows 8. Lenovo is doing better and Dell's push up the value train into enterprise software and services isn't resulting in higher revenues and profits. Had storage revenues been growing then that profits picture would be more cheerful. 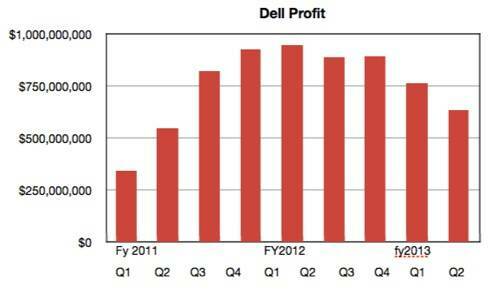 Dell could not have predicted storage revenues falling. The storage business was worth a half-billion-dollars a quarter and climbing to the technology giant. But the latest quarter showed revenues of $435m, $9m down on the previous quarter and 13 per cent down annually. The two great storage acquisitions – EqualLogic and Compellent block storage arrays, with fill-ins like Ocarina and ExaGrid – were intended to drive Dell's revenues higher after it walked away from its EMC reselling deal in October 2011. The firm's grand schemes include the cross-fertilisation of storage products with data reduction and file access added to the block storage products, the addition of the DR4000 disk-to-disk backup system, as well as the DX6000 object storage array with added Caringo software. What the chart says is that these strategies are not working. Or, more accurately, haven't worked yet (after all, it is a backwards look). EMC's mid-range block VNX arrays are selling very well, and EMC and NetApp have the filer market sewn up. On the other hand, Dell does not have an impressive filer offering. Its de-duping disk-to-disk backup product is nowhere compared to Data Domain. It has no high-end array to match HDS's VSP, IBM's DS8000 or EMC's VMAX. What can it do? Dell can plug away in patience, innovating inside its products, develop its Hermes server caching technology, and make more software acquisitions like Quest for backup. It can also reach deeper into its wallet and buy in new tech, such a flash array business, seeing as EqualLogic and Compellent arrays have reached their zenith and aren't going to grow revenues any higher.